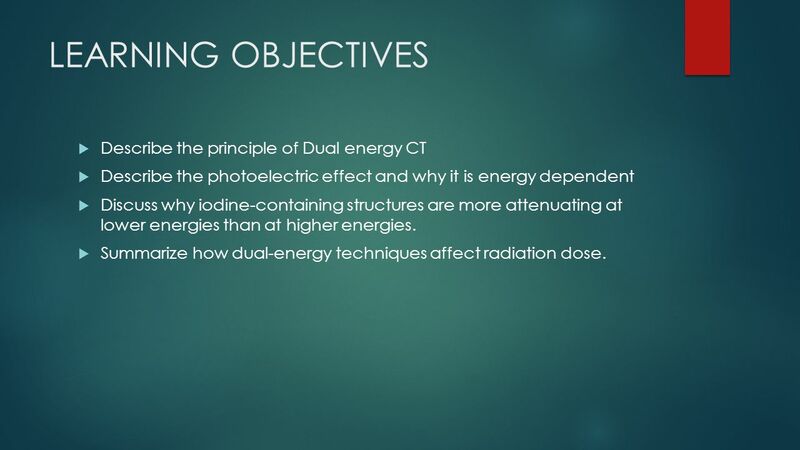 Describe the photoelectric effect and why it is energy dependent Discuss why iodine-containing structures are more attenuating at lower energies than at higher energies. Summarize how dual-energy techniques affect radiation dose. 3 Introduction How a substance behaves at two different energies can provide information about tissue composition beyond that obtainable with single-energy techniques. Early work in the 1970s and 1980s demonstrated that dual-energy technology improved tissue characterization Its utility was limited because of noise in the low-kilo voltage images and the amount of time required for data acquisition, which led to miss registration. CT technologies that allow for more rapid data acquisition have renewed interest in dual-energy applications. Manufacturers continue to improve dual-energy CT scanners, and those that are currently available differ in terms of the number of x-ray tubes, the number and arrangement of detector arrays, the energy of fan beams, and the rotation of x-ray tubes and detector arrays. 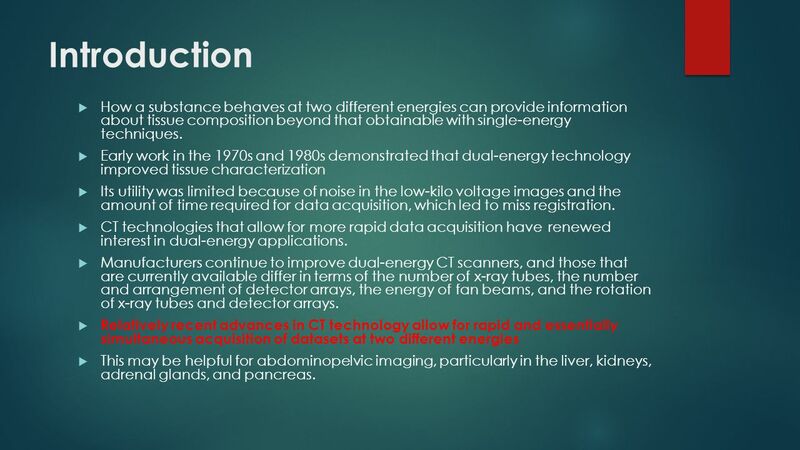 Relatively recent advances in CT technology allow for rapid and essentially simultaneous acquisition of datasets at two different energies This may be helpful for abdominopelvic imaging, particularly in the liver, kidneys, adrenal glands, and pancreas. Knowing how a substance behaves at two different energies can provide information about tissue composition beyond that obtainable with single-energy techniques (1–5). Early work in the 1970s and 1980s demonstrated that dual-energy technology improved tissue characterization; however, its utility was limited because of noise in the low-kilovoltage images and the amount of time required for data acquisition, which led to misregistration (3–7). Newer CT technologies that allow for more rapid data acquisition have sparked renewed interest in dual-energy applications. Manufacturers continue to improve dual-energy CT scanners, and those that are currently available differ in terms of the number of x-ray tubes, the number and arrangement of detector arrays, the energy of fan beams, and the rotation of x-ray tubes and detector arrays. Relatively recent advances in CT technology allow for rapid and essentially simultaneous acquisition of datasets at two different energies, depending on the manufacturer. In addition, current dual-source CT scanners offer improved temporal resolution, which is helpful for cardiac CT angiography, and increased photon flux, which may be helpful when imaging large or obese patients (8–12). 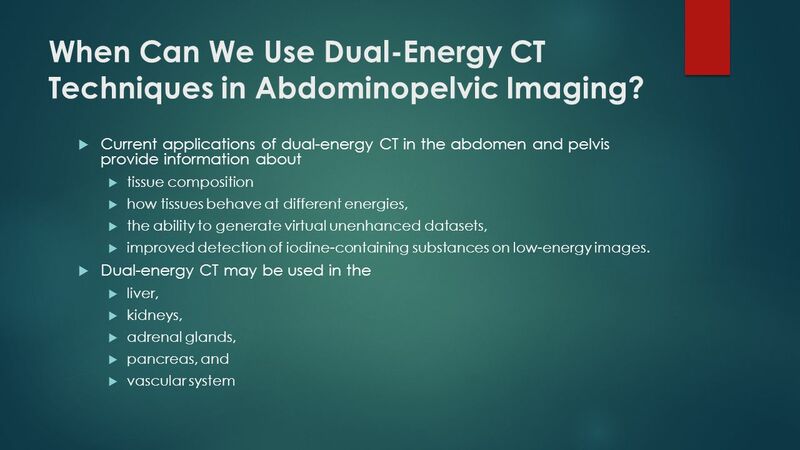 The ability of current dual-energy CT systems to simultaneously (or near-simultaneously) acquire images at two different energies is the focus of this article, which discusses how dual-energy CT works, the kinds of information it provides, and scenarios in which it may be helpful for abdominopelvic imaging, particularly in the liver, kidneys, adrenal glands, and pancreas. 4 How Does Dual-Energy CT Work? 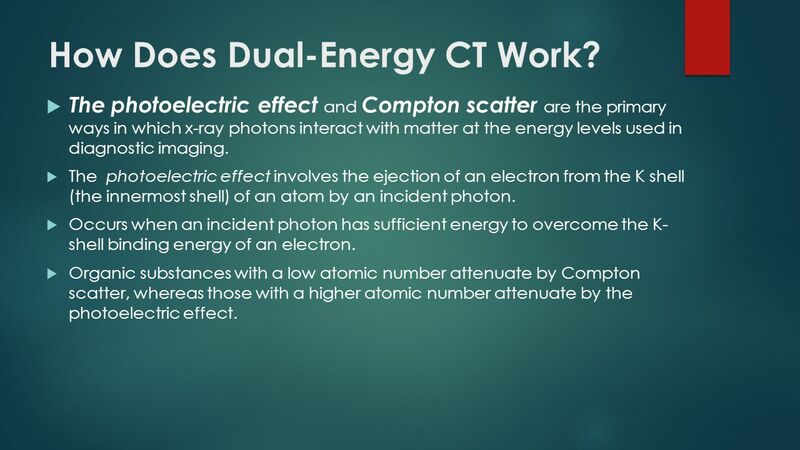 The photoelectric effect and Compton scatter are the primary ways in which x-ray photons interact with matter at the energy levels used in diagnostic imaging. The photoelectric effect involves the ejection of an electron from the K shell (the innermost shell) of an atom by an incident photon. Occurs when an incident photon has sufficient energy to overcome the K- shell binding energy of an electron. Organic substances with a low atomic number attenuate by Compton scatter, whereas those with a higher atomic number attenuate by the photoelectric effect. The photoelectric effect and Compton scatter are the primary ways in which x-ray photons interact with matter at the energy levels used in diagnostic imaging. The term photoelectric effect refers to the ejection of an electron from the K shell (the innermost shell) of an atom by an incident photon. An electron from an adjacent shell fills the void, and energy is released in the form of a photoelectron (13). The photoelectric effect occurs when an incident photon has sufficient energy to overcome the K-shell binding energy of an electron (13). Organic substances with a low atomic number are affected by Compton scatter, whereas those with a higher atomic number are affected by the photoelectric effect. The photoelectric effect is energy dependent, and its likelihood increases as the energy of the incident photon approximates the K-shell binding energy of an electron (13). The K-shell binding energy varies for each element, and it increases as the atomic number increases. The term K edge refers to the spike in attenuation that occurs at energy levels just greater than that of the K-shell binding because of the increased photoelectric absorption at these energy levels. K-edge values vary for each element, and they increase as the atomic number increases (Table). its likelihood increases as the energy of the incident photon approximates the K- shell binding energy of an electron. The K-shell binding energy varies for each element, and it increases as the atomic number increases. 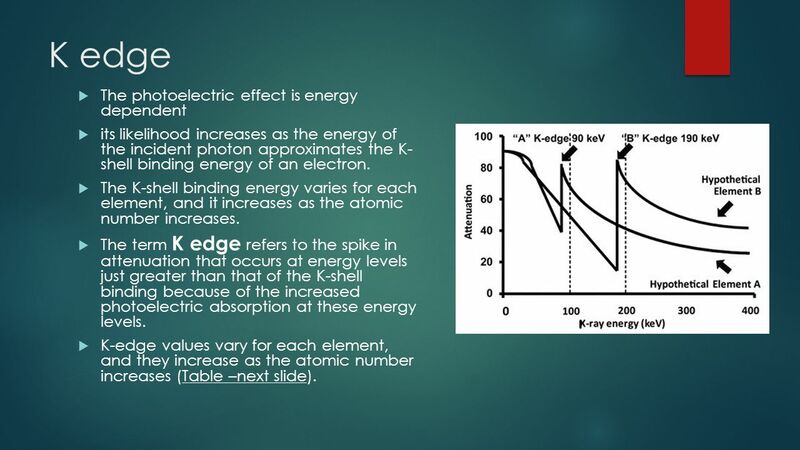 The term K edge refers to the spike in attenuation that occurs at energy levels just greater than that of the K-shell binding because of the increased photoelectric absorption at these energy levels. 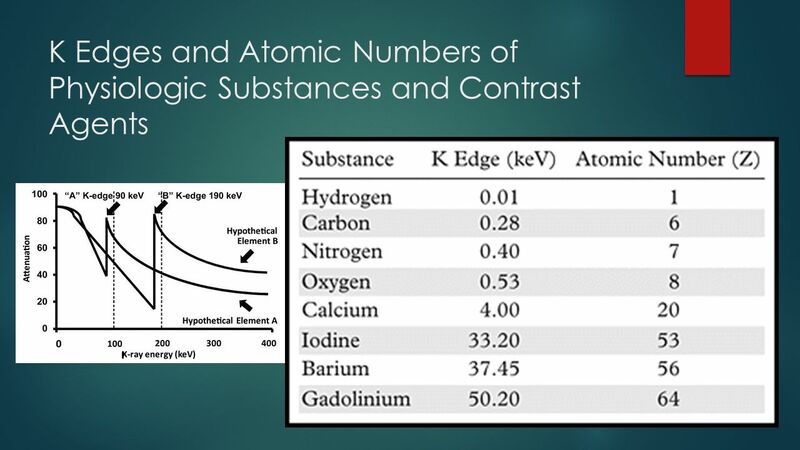 K-edge values vary for each element, and they increase as the atomic number increases (Table –next slide). 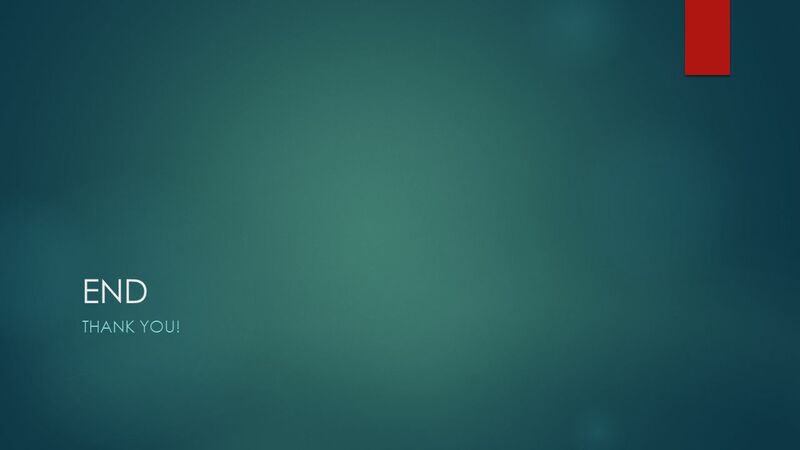 7 How to use? Hypothetical elements A and B, which have K edges of 90 kev and 190 kev, respectively. The percentage of x-ray photon absorption is plotted as a function of x-ray energy (in kev). If four unknown substances with varying amounts of elements A and B are imaged at 100 kvp and 200 kvp, the relative amounts of element A and element B in each substance can be determined on the basis of the attenuation of the substances at each energy. To understand the principles underlying dual-energy techniques, imagine hypothetical elements A and B, with K edges of 90 keV and 190 keV, respectively (Fig 1). Next, imagine four unknown substances, each of which contains unknown quantities of hypothetical elements A and B. 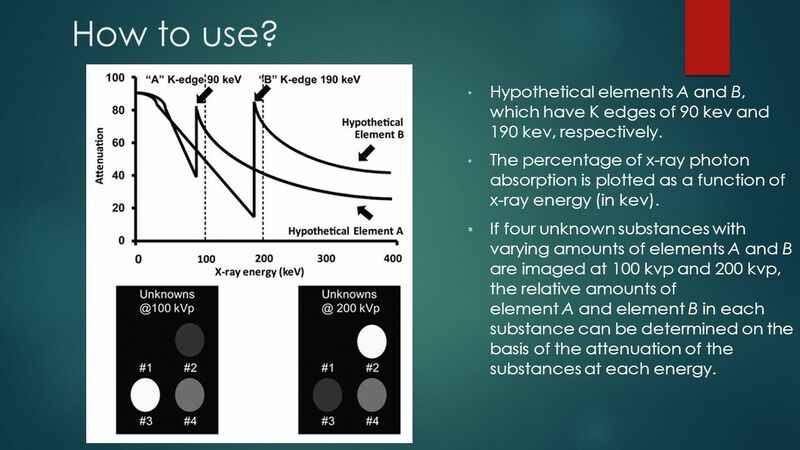 To determine the relative amounts of elements A and B in each unknown substance, the substances are imaged at two different energies: 100 kVp and 200 kVp. The results are illustrated in Figure 1. A simplified schematic is assumed, in which there is minimal spread of energies around the stated kilovolt peak. Figure 1. Illustration of dual-energy technique shows hypothetical elements A and B, which have K edges of 90 keV and 190 keV, respectively. The percentage of x-ray photon absorption is plotted as a function of x-ray energy (in keV). If four unknown substances with varying amounts of elements A and Bare imaged at 100 kVp and 200 kVp, the relative amounts of element A and element B in each substance can be determined on the basis of the attenuation of the substances at each energy. Translating this principle to human tissues introduces many confounding variables. The human body is made up of many different elements—primarily carbon, oxygen, hydrogen, nitrogen, phosphorous, and calcium— which are arranged in many different combinations. Hydrogen, carbon, nitrogen, and oxygen have similar K edges, ranging from 0.01 to 0.53 keV. 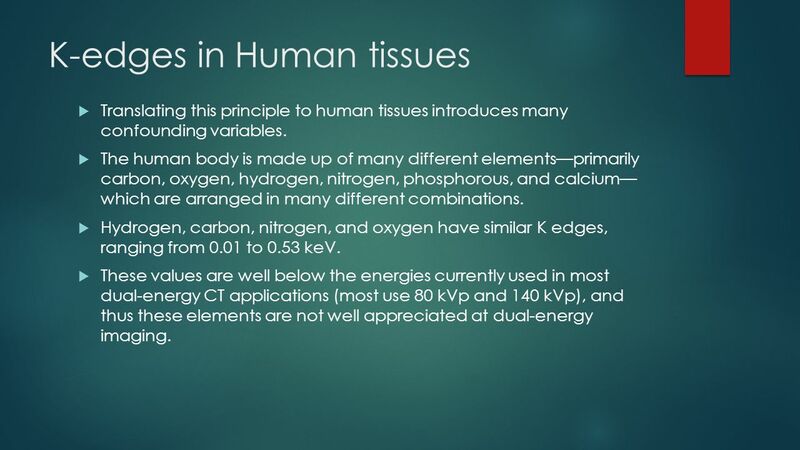 These values are well below the energies currently used in most dual-energy CT applications (most use 80 kVp and 140 kVp), and thus these elements are not well appreciated at dual-energy imaging. Iodine (33.2 keV) are higher than those of soft tissues, Although they are lower than those of most inorganic elements, they are sufficiently different from those of soft tissues. So they may be distinguished from soft tissues at dual-energy imaging. Graph of mass-attenuation coefficients for iodine (blue), calcium (green), and water (red) on CT images obtained at two different energies (vertical dashed lines) shows that these materials can be characterized by comparing their attenuation at the lower energy with that at the higher energy. 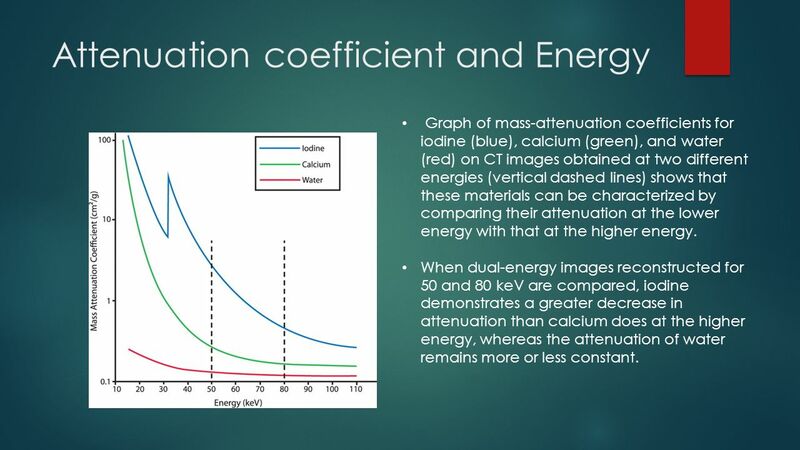 When dual-energy images reconstructed for 50 and 80 keV are compared, iodine demonstrates a greater decrease in attenuation than calcium does at the higher energy, whereas the attenuation of water remains more or less constant. . Graph of mass-attenuation coefficients for iodine (blue), calcium (green), and water (red) on CT images obtained at two different energies (vertical dashed lines) shows that these materials can be characterized by comparing their attenuation at the lower energy with that at the higher energy. 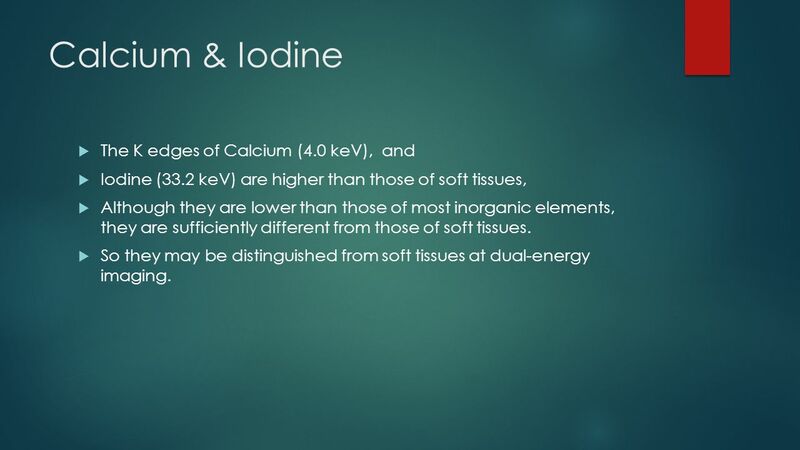 When dual-energy images reconstructed for 50 and 80 keV are compared, iodine demonstrates a greater decrease in attenuation than calcium does at the higher energy, whereas the attenuation of water remains more or less constant. 11 Implications Dual-energy CT techniques may be used to distinguish substances such as iodine, calcium, and uric acid crystals from soft tissues. The closer the energy level is to the K edge of a substance such as iodine, the more the substance attenuates. 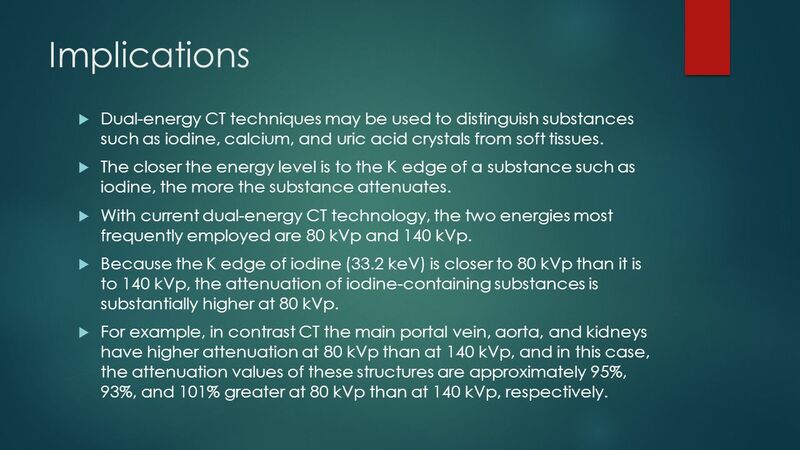 With current dual-energy CT technology, the two energies most frequently employed are 80 kVp and 140 kVp. Because the K edge of iodine (33.2 keV) is closer to 80 kVp than it is to 140 kVp, the attenuation of iodine-containing substances is substantially higher at 80 kVp. For example, in contrast CT the main portal vein, aorta, and kidneys have higher attenuation at 80 kVp than at 140 kVp, and in this case, the attenuation values of these structures are approximately 95%, 93%, and 101% greater at 80 kVp than at 140 kVp, respectively. There is a bell curve of energies for a set of photons at a certain kilovolt peak. 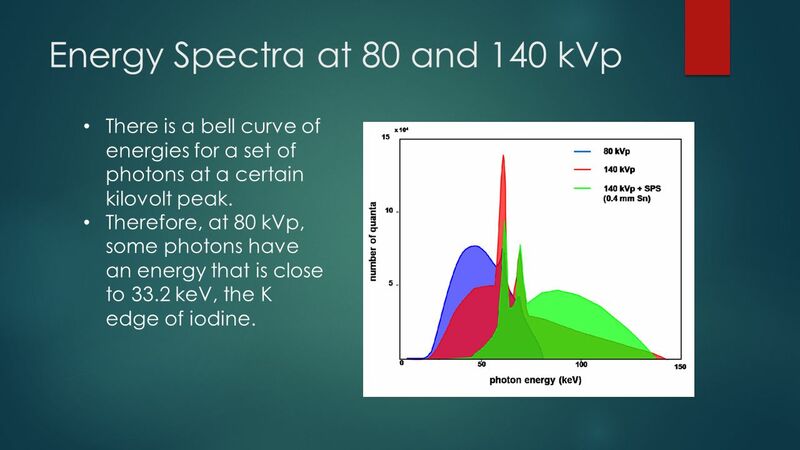 Therefore, at 80 kVp, some photons have an energy that is close to 33.2 keV, the K edge of iodine. 13 Increased attenuation of iodine-containing structures on lower-energy images. 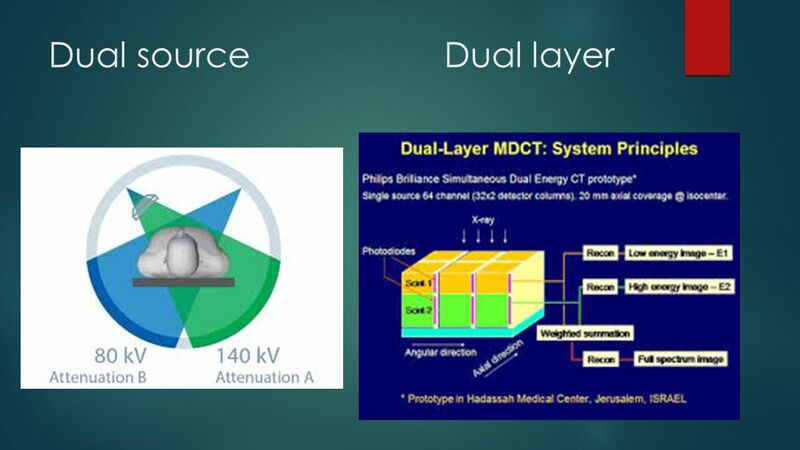 Three types of dual-energy CT scanners are available that differ in the technique used to acquire high- and low-energy CT datasets: Dual-Source Scanner with Dual Detector Arrays Single-Source Scanner with Fast Kilovoltage Switching Single-Source Scanner with Dual Detector Layers The prototype for another single-source dual-energy CT scanner (Brilliance CT; Philips Healthcare, Andover, Mass) has a modified detector array with two scintillation layers arranged one atop the other to receive separate high- and low-energy image data streams from a single x-ray source. The bottom detector layer captures high- energy data, and the top layer captures low-energy data; from these two datasets, two separate image series are reconstructed . This dual-energy CT scanner is not yet available for routine clinical use. 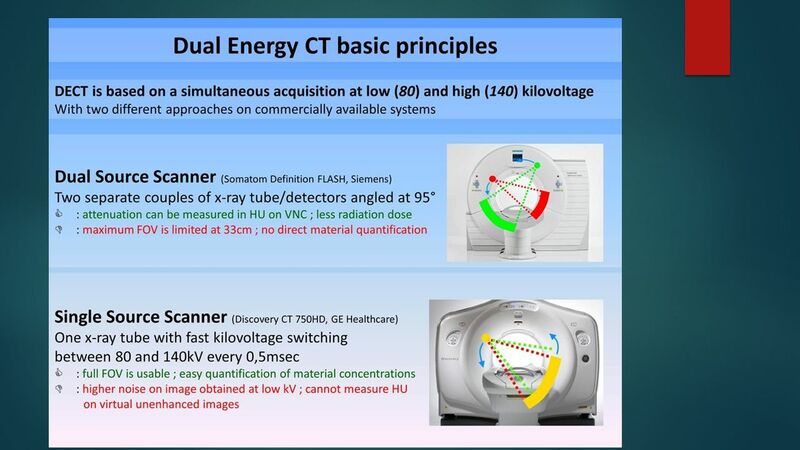 Three types of dual-energy CT scanners are available that differ in the technique used to acquire high- and low-energy CT datasets: a dual-source dual-energy scanner, a single-source dual-energy scanner with fast kilovoltage switching (ie, rapid alternation between high and low kilovoltage settings), and a single-source dual-energy scanner with dual detector layers. Dual-Source Scanner with Dual Detector Arrays On the dual-source scanner (Somatom Definition; Siemens, Forchheim, Germany), two separate detector arrays acquire two different image datasets from two separate x-ray tubes operating at two different tube potentials (11). 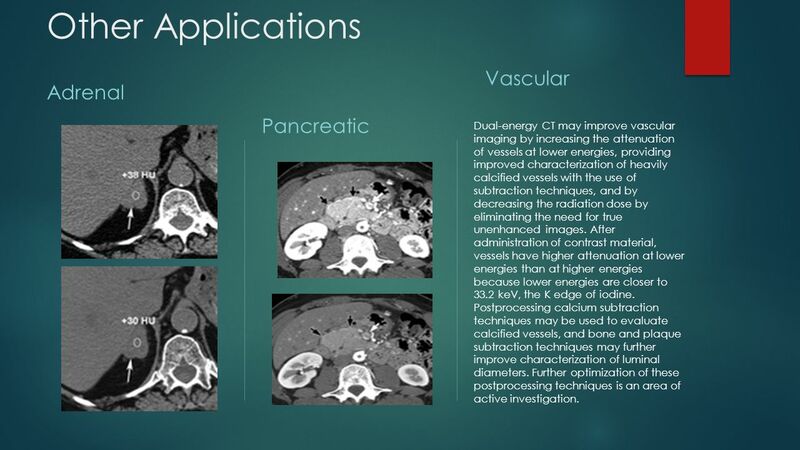 High-energy scans are obtained at 120 or 140 kVp, and low-energy scans are obtained simultaneously at 80 or 100 kVp (5,11). The use of two separate x-ray sources allows beam filtration and adjustment of the current in each tube in order to optimize image quality. Dual-source dual-energy CT images are somewhat limited in temporal registration because the high- and low-energy datasets are obtained at slightly different times. Furthermore, the limited (33-cm) field of view available for use in image analysis could impede evaluation of the entirety of some abdominal organs in patients with a large body habitus. Single-Source Scanner with Fast Kilovoltage Switching This single-source CT scanner with a single detector layer (Discovery CT 750HD; GE Healthcare, Milwaukee, Wis) relies on a single x-ray source with fast switching between two kilovoltage settings (80 and 140 kVp) at intervals of 0.5 msec during a single gantry rotation to generate high- and low-energy x-ray spectra (12). The tube current cannot be altered simultaneously; it remains constant during both high- and low-energy acquisitions. To account for the higher tube output at 140 kVp, the exposure time ratio is varied between the 80-kVp and the 140-kVp acquisitions to maximize the contrast-to-noise ratio: typically, 65% of the exposure time is used for the 80-kVp acquisition, and 35%, for the 140-kVp acquisition (13). A detector with a fast response and a data acquisition system with a fast sampling capability are used to capture the alternating high- and low-energy data (12). The advantages of dual-energy CT with fast kilovoltage switching are good temporal registration between high- and low-energy datasets, which are obtained nearly simultaneously, and the availability of the full 50-cm field of view for use in image analysis. However, because a single x-ray source is used, individual modification of the high- and low-energy x-ray beams is difficult (not yet possible on commercially available scanners), and spectral overlap is increased. Single-Source Scanner with Dual Detector Layers The prototype for another single-source dual-energy CT scanner (Brilliance CT; Philips Healthcare, Andover, Mass) has a modified detector array with two scintillation layers arranged one atop the other to receive separate high- and low-energy image data streams from a single x-ray source (14). The bottom detector layer captures high-energy data, and the top layer captures low-energy data; from these two datasets, two separate image series are reconstructed (14,15). This dual-energy CT scanner is not yet available for routine clinical use. 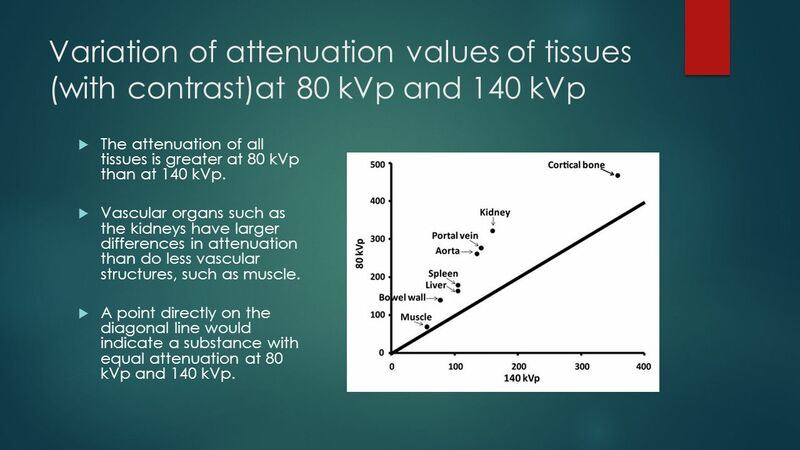 The attenuation of all tissues is greater at 80 kVp than at 140 kVp. Vascular organs such as the kidneys have larger differences in attenuation than do less vascular structures, such as muscle. A point directly on the diagonal line would indicate a substance with equal attenuation at 80 kVp and 140 kVp. 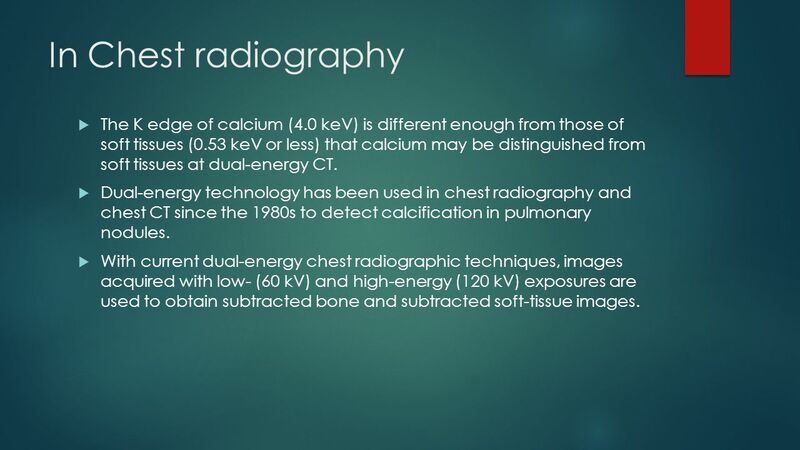 18 In Chest radiography The K edge of calcium (4.0 keV) is different enough from those of soft tissues (0.53 keV or less) that calcium may be distinguished from soft tissues at dual-energy CT. Dual-energy technology has been used in chest radiography and chest CT since the 1980s to detect calcification in pulmonary nodules. 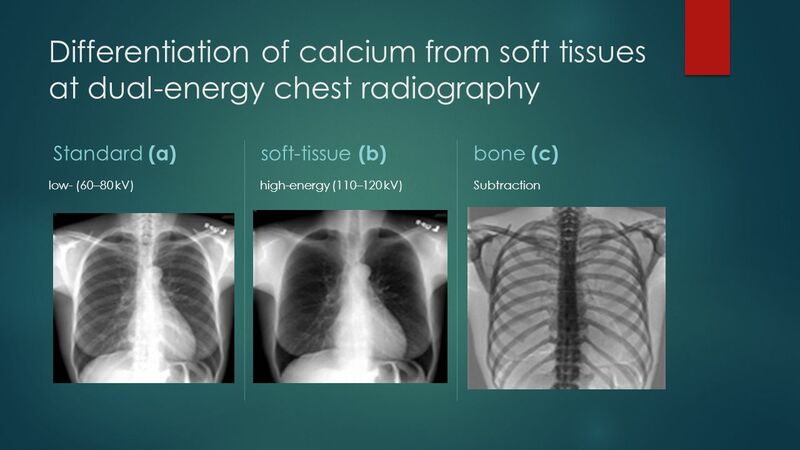 With current dual-energy chest radiographic techniques, images acquired with low- (60 kV) and high-energy (120 kV) exposures are used to obtain subtracted bone and subtracted soft-tissue images. 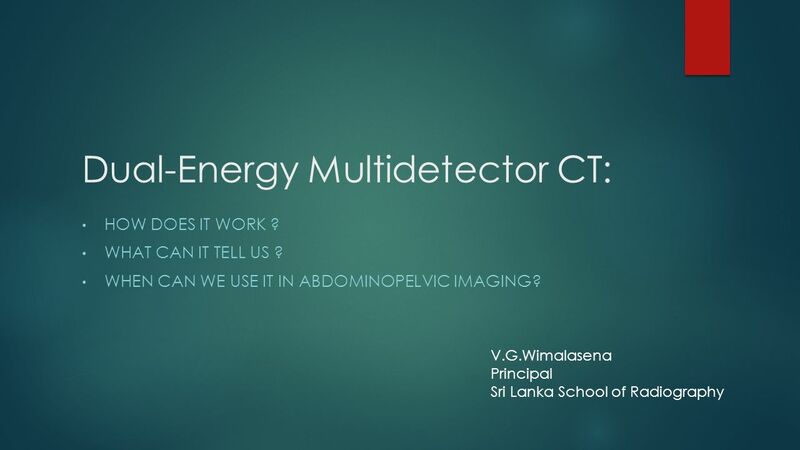 20 When Can We Use Dual-Energy CT Techniques in Abdominopelvic Imaging? 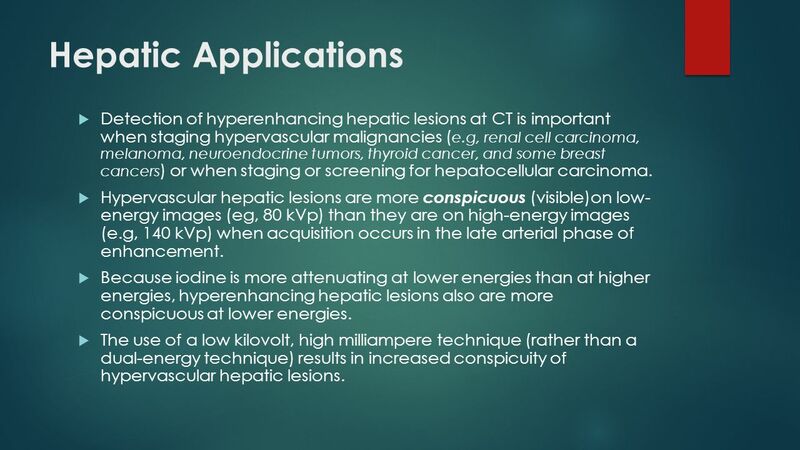 21 Hepatic Applications Detection of hyperenhancing hepatic lesions at CT is important when staging hypervascular malignancies (e.g, renal cell carcinoma, melanoma, neuroendocrine tumors, thyroid cancer, and some breast cancers) or when staging or screening for hepatocellular carcinoma. Hypervascular hepatic lesions are more conspicuous (visible)on low- energy images (eg, 80 kVp) than they are on high-energy images (e.g, 140 kVp) when acquisition occurs in the late arterial phase of enhancement. 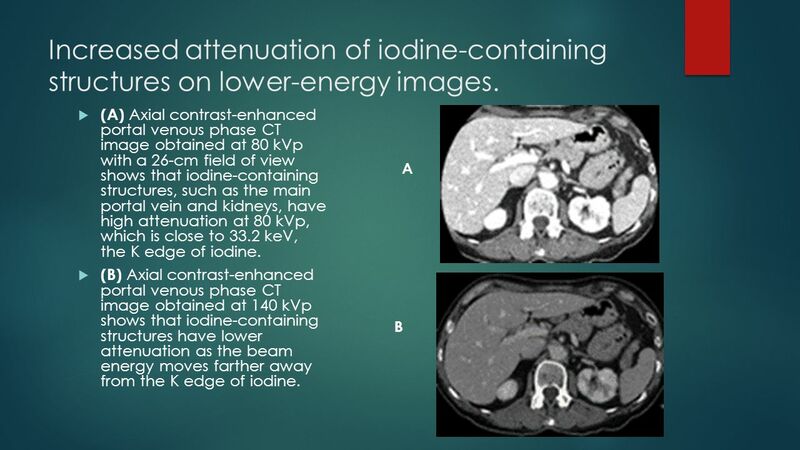 Because iodine is more attenuating at lower energies than at higher energies, hyperenhancing hepatic lesions also are more conspicuous at lower energies. The use of a low kilovolt, high milliampere technique (rather than a dual-energy technique) results in increased conspicuity of hypervascular hepatic lesions. 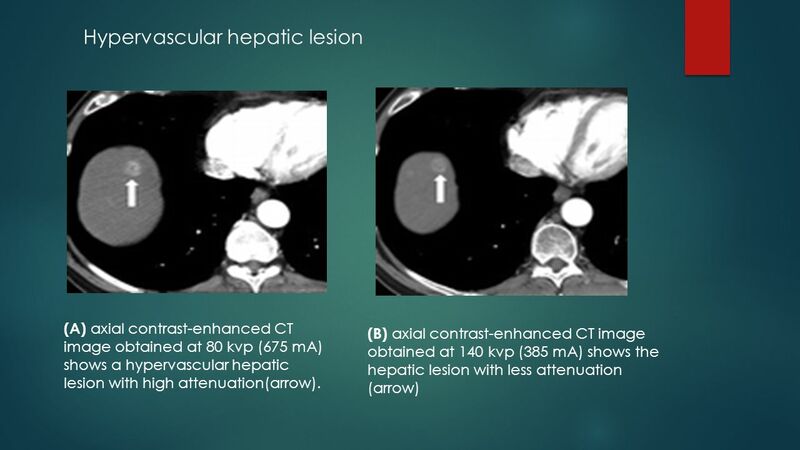 Detection of hyperenhancing hepatic lesions at CT is important when staging hypervascular malignancies (eg, renal cell carcinoma, melanoma, neuroendocrine tumors, thyroid cancer, and some breast cancers) or when staging or screening for hepatocellular carcinoma. Hypervascular hepatic lesions are more conspicuous on low-energy images (eg, 80 kVp) than they are on high-energy images (e.g, 140 kVp) when acquisition occurs in the late arterial phase of enhancement. 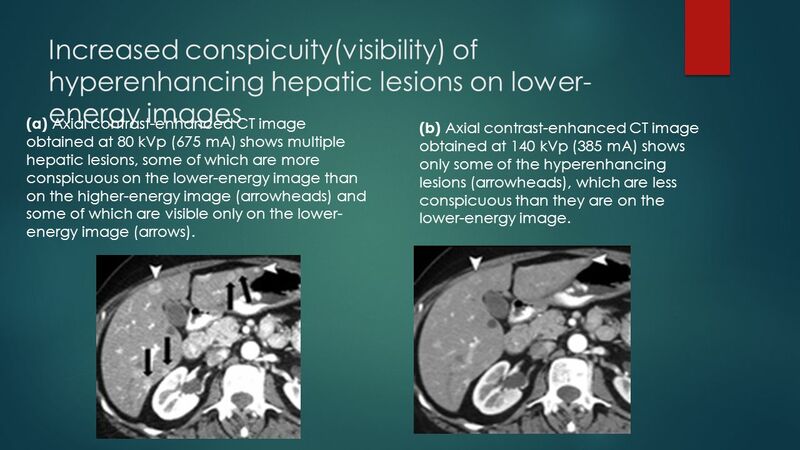 Because iodine is more attenuating at lower energies than at higher energies, hyperenhancing hepatic lesions also are more conspicuous at lower energies (Figs 5– 7). The use of a low kilovolt, high milliampere technique (rather than a dual-energy technique) results in increased conspicuity of hypervascular hepatic lesions. Hypervascular hepatic lesion in a 56-year-old man with hepatitis C who underwent a screening examination. (a) Axial contrast-enhanced CT image obtained at 80 kVp (675 mA) shows a hypervascular hepatic lesion (arrow). 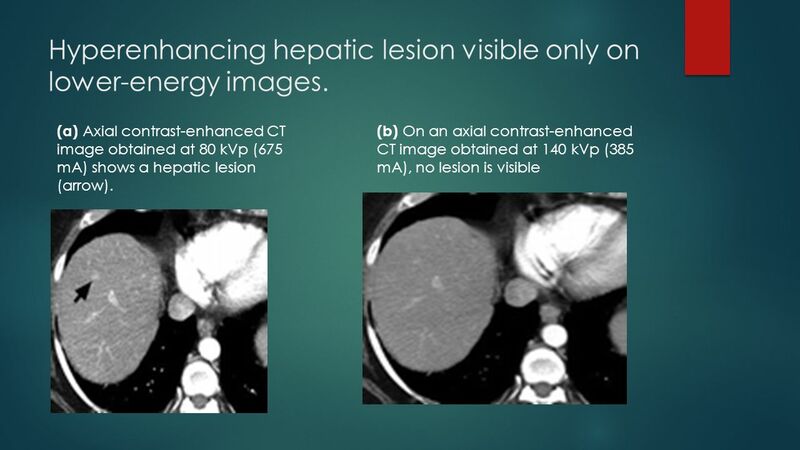 (b) Axial contrast-enhanced CT image obtained at 140 kVp (385 mA) shows the hepatic lesion (arrow), but it is less conspicuous than it is at 80 kVp because the K edge of iodine (33.2 keV) is closer to 80 kVp than it is to 140 kVp. Note that the higher-energy image (b) is less noisy than the lower-energy image (a). (a) Axial contrast-enhanced CT image obtained at 80 kVp (675 mA) shows multiple hepatic lesions, some of which are more conspicuous on the lower-energy image than on the higher-energy image (arrowheads) and some of which are visible only on the lower-energy image (arrows). (b) Axial contrast-enhanced CT image obtained at 140 kVp (385 mA) shows only some of the hyperenhancing lesions (arrowheads), which are less conspicuous than they are on the lower-energy image. (a) Axial contrast-enhanced CT image obtained at 80 kVp (675 mA) shows multiple hepatic lesions, some of which are more conspicuous on the lower-energy image than on the higher-energy image (arrowheads) and some of which are visible only on the lower-energy image (arrows). (b) Axial contrast-enhanced CT image obtained at 140 kVp (385 mA) shows only some of the hyperenhancing lesions (arrowheads), which are less conspicuous than they are on the lower-energy image. 24 Hyperenhancing hepatic lesion visible only on lower-energy images. (a) Axial contrast-enhanced CT image obtained at 80 kVp (675 mA) shows a hepatic lesion (arrow). (b) On an axial contrast-enhanced CT image obtained at 140 kVp (385 mA), no lesion is visible Hyperenhancing hepatic lesion visible only on lower-energy images. (a) Axial contrast-enhanced CT image obtained at 80 kVp (675 mA) shows a hepatic lesion (arrow). (b) On an axial contrast-enhanced CT image obtained at 140 kVp (385 mA), no lesion is visible. 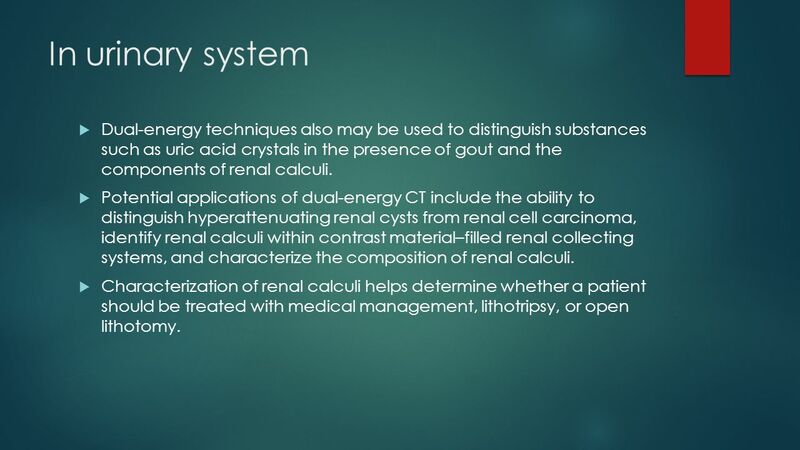 25 In urinary system Dual-energy techniques also may be used to distinguish substances such as uric acid crystals in the presence of gout and the components of renal calculi. 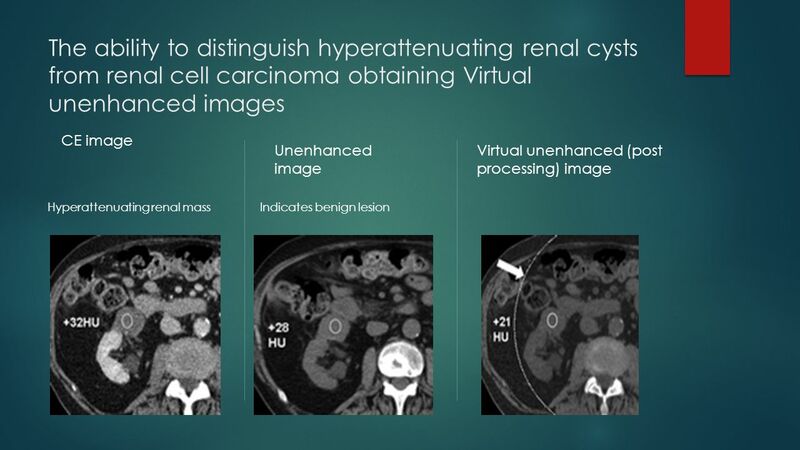 Potential applications of dual-energy CT include the ability to distinguish hyperattenuating renal cysts from renal cell carcinoma, identify renal calculi within contrast material–filled renal collecting systems, and characterize the composition of renal calculi. Characterization of renal calculi helps determine whether a patient should be treated with medical management, lithotripsy, or open lithotomy. 26 The ability to distinguish hyperattenuating renal cysts from renal cell carcinoma obtaining Virtual unenhanced images CE image Unenhanced image Virtual unenhanced (post processing) image Hyperattenuating renal mass Indicates benign lesion Hyperattenuating renal cyst. (a) Axial contrast-enhanced nephrographic phase CT image shows an exophytic, hyperattenuating renal mass with attenuation of +32 HU arising from the interpolar portion of the right kidney. The differential diagnosis includes a hyperattenuating cyst and renal cell carcinoma. (b) True unenhanced axial CT image shows the renal mass with attenuation of +28 HU, a finding indicative of a benign lesion, such as a hemorrhagic or proteinaceous cyst. (c) Virtual unenhanced axial CT image, which was generated with postprocessing techniques, shows the same renal mass with attenuation of +21 HU. Note the margins of the field of view (dotted white line, arrow), which was 26 cm, of one of the detectors. 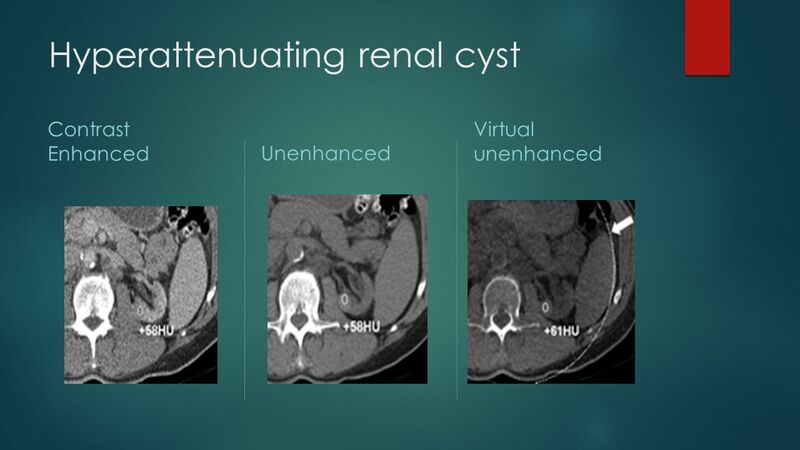 Contrast Enhanced Unenhanced Virtual unenhanced Hyperattenuating renal cyst. (a) Axial contrast-enhanced nephrographic phase CT image shows a hyperattenuating mass with attenuation of +58 HU in the interpolar portion of the atrophic left kidney. (b) True unenhanced axial CT image shows the mass with attenuation of +58 HU, a finding indicative of a hemorrhagic or proteinaceous cyst. (c) Virtual unenhanced axial CT image generated with postprocessing techniques shows the mass with attenuation of +61 HU, a finding indicative of a hemorrhagic or proteinaceous cyst. Note the margins of the field of view (dotted white line, arrow), which was 26 cm, of one of the detectors. Renal cell carcinoma. (a) Axial contrast-enhanced nephrographic phase CT image shows an exophytic, hyperattenuating mass with attenuation of +73 HU arising from the interpolar portion of the right kidney. The differential diagnosis includes a hyperattenuating cyst and a solid neoplasm, particularly renal cell carcinoma. (b) True unenhanced axial CT image shows the mass with attenuation of +21 HU. 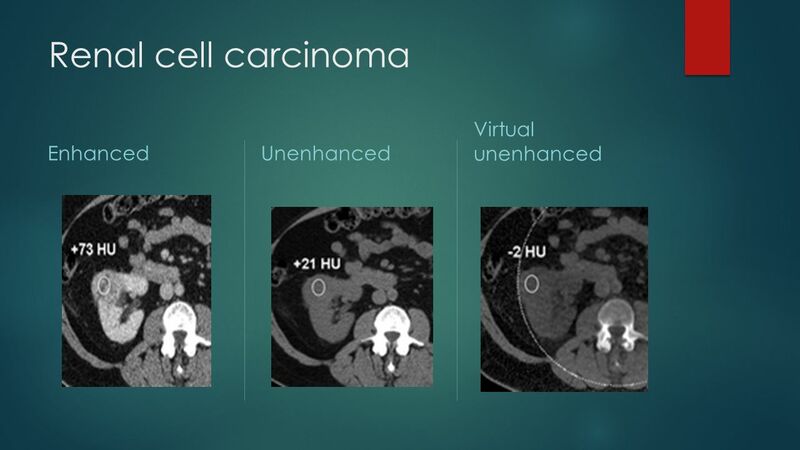 (c) Virtual unenhanced image generated with postprocessing techniques shows the mass with attenuation of –2 HU, a finding indicative of renal cell carcinoma. Note the margins of the field of view (dotted white line), which was 26 cm, of one of the detectors. Dual-energy CT may improve vascular imaging by increasing the attenuation of vessels at lower energies, providing improved characterization of heavily calcified vessels with the use of subtraction techniques, and by decreasing the radiation dose by eliminating the need for true unenhanced images. After administration of contrast material, vessels have higher attenuation at lower energies than at higher energies because lower energies are closer to keV, the K edge of iodine. Postprocessing calcium subtraction techniques may be used to evaluate calcified vessels, and bone and plaque subtraction techniques may further improve characterization of luminal diameters. Further optimization of these postprocessing techniques is an area of active investigation. Adrenal metastasis in a 63-year-old woman with non–small cell lung carcinoma. (a) Axial unenhanced CT image obtained at 80 kVp (675 mA) shows an adrenal lesion (arrow) with attenuation of +38 HU. (b) Axial unenhanced CT image obtained at 140 kVp (385 mA) shows the adrenal lesion (arrow) with attenuation of +30 HU. Findings are not diagnostic of an adenoma, and the lesion was later determined to be an adrenal metastasis. Note that the attenuation of the mass is higher at 80 kVp than at 140 kVp. Increased attenuation of pancreatic parenchyma and surrounding blood vessels on lower-energy images. (a) Axial contrast-enhanced late arterial phase CT image obtained at 80 kVp (540 mAs) shows the aorta (*), arterial branches around the pancreatic head (black arrows), and the superior mesenteric vein (white arrow). (b) Axial contrast-enhanced late arterial phase CT image obtained at 140 kVp (308 mAs) shows the superior mesenteric vein (white arrow), small arterial branches around the head of the pancreas (black arrows), and pancreatic parenchyma, all of which have higher attenuation at 80 kVp than at 140 kVp. * = aorta. Dual-energy CT may improve vascular imaging by increasing the attenuation of vessels at lower energies, providing improved characterization of heavily calcified vessels with the use of subtraction techniques, and by decreasing the radiation dose by eliminating the need for true unenhanced images. After administration of contrast material, vessels have higher attenuation at lower energies than at higher energies because lower energies are closer to 33.2 keV, the K edge of iodine (53–55). Postprocessing calcium subtraction techniques may be used to evaluate calcified vessels, and bone and plaque subtraction techniques may further improve characterization of luminal diameters (56,57). Further optimization of these postprocessing techniques is an area of active investigation. 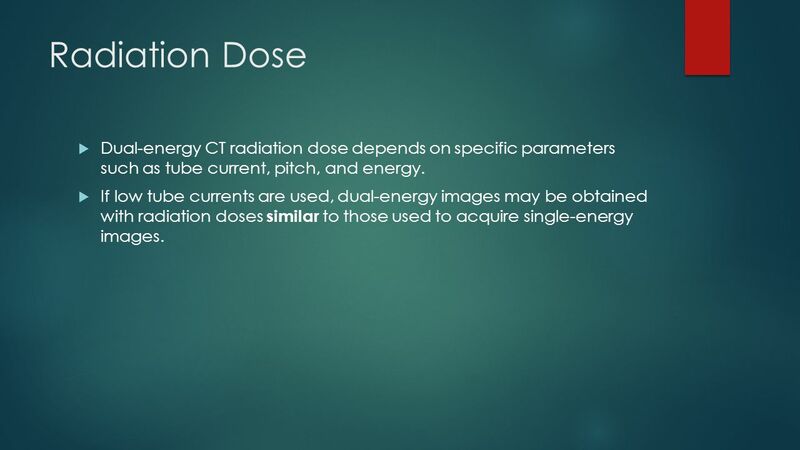 30 Radiation Dose Dual-energy CT radiation dose depends on specific parameters such as tube current, pitch, and energy. If low tube currents are used, dual-energy images may be obtained with radiation doses similar to those used to acquire single-energy images. 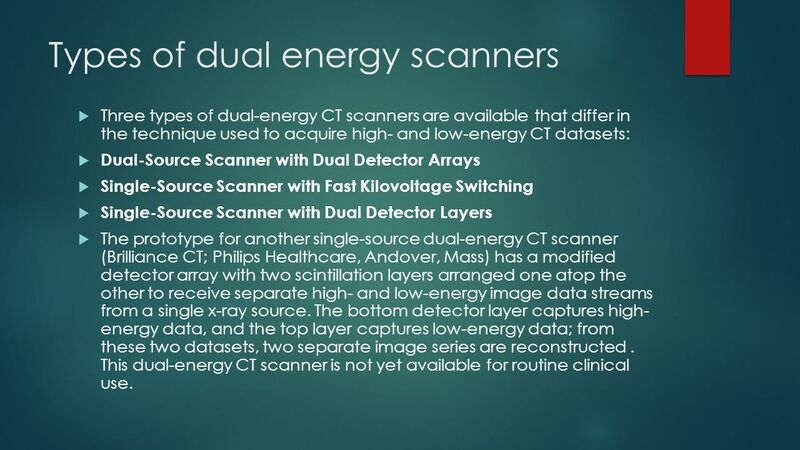 Download ppt "Dual-Energy Multidetector CT:"
X Rays Medical Physics Notes. Improved Conspicuity of Abdominal Lesions with Single-Source Dual-Energy MDCT Hadassah Hebrew University Medical Center Jerusalem, Israel Ruth Eliahou. BIOE 220/RAD 220 REVIEW SESSION January 30, 2011. A Technical Seminar On X-RAY AND CT SCAN. Advanced Biomedical Imaging Dr. Azza Helal A. Prof. of Medical Physics Faculty of Medicine Alexandria University Lecture 6 Basic physical principles of. X-ray radiography Seminar The "geometrical" unsharpness of X-ray images is limited by finite dimension of the source, i.e. the window on.